Paperback, 10.75 x 10 in. / 106 pgs / 91 color / 2 bw. Text by Ulrich Wilmes. Interview by Achim Borchardt-Hume. Mixing art historical references with images taken from the internet, the paintings of Polish artist Wilhelm Sasnal (born 1972) borrow liberally from the image glut around us, appropriating anything from icons of popular culture such as Roy Orbison to paintings of the past such as Georges Seurat’s “Bathers at Asnières”--from the lonesome cowboys in a Steven Spielberg film to the photographs of Enrique Metinides. In an era flooded by photographic images, Sasnal’s work attests to the continuous spellbinding power of painting to cohere and recode visual data. 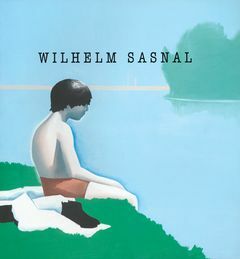 This volume, published for a major show at the Whitechapel Gallery in London, surveys Sasnal’s paintings of the past ten years. It opens with recent works referencing world events and the artist’s extensive travels before returning to Pop-inspired work from the 1990s and reflections on the troubled history of his native Poland. Once, art was the news; now, the news often looks like art. This evolution - or dissolution - of aesthetic boundaries informs Sasnal's own: "I cannot," he says, "make a distinction between what is public and what is private." Everything that happens, happens on screen. And everything - family members, migrant workers, a power plant in Iran (from a photgraph of same) - is rendered by Sasnal with the same smooth opacity. Whites are matte and plaster-thick, blues light and lusterless, the color of Mac desktop folders. FORMAT: Pbk, 10.75 x 10 in. / 106 pgs / 91 color / 2 b&w.